I can count on one hand the number of points that I agree with in this piece by Tony Mirchandani entitled "The 70s—Cheap Stunts, Loud Music, Stale Stars"—and one of those is that villains often wear "silver, blonde, or even purple wigs." Some of the observations just don't hold up under the privilege of hindsight; for example, we would probably all agree that Amitabh Bachchan has had plenty of staying power, even if we haven't always applauded his deployment of it. 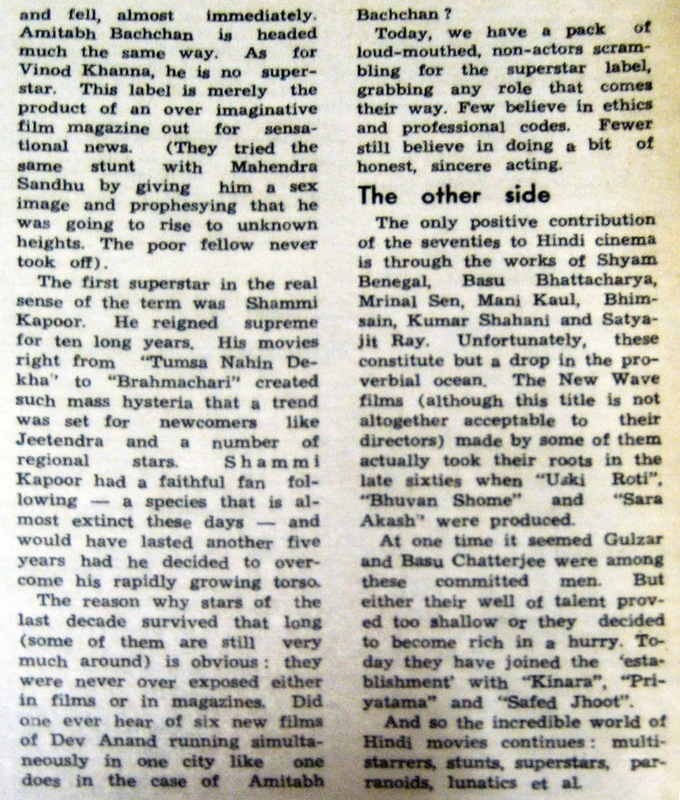 Mirchandani's claim that films and audiences are wildly unpredictable is an interesting contrast to what I feel I hear critics of Bollywood (by which I mean people who don't like it or dismiss it, not the film critics) say in despair of "mass entertainers" today. 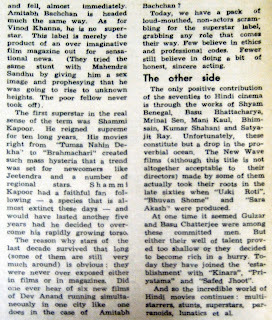 This piece appeared in the same issue of Filmfare in which I found the article on Vinod Khanna quitting the industry and the kerfuffle over the casting of Kranti (see them here). I have to applaud Filmfare for running a piece with such a crabby humorless lacking in imagination and capacity for joy divergent attitude towards contemporary popular cinema. 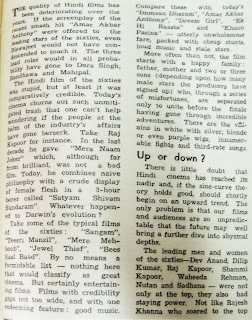 The first image shows the whole page; click on the second two to get images big enough to read. "Fewer still believe in doing a bit of honest, sincere acting." Looks like things haven't changed all that much! Also, it's a paradox that film and audiences really are unpredictable - the minute you think you've got them pegged as "unilaterally loving mass entertainers", they'll ensure that the next one is a flop. Loving the 70's Filmfare flashback! My love affair with them started in the late 80s. Stardust too. Neeta's Natter....eeee! getfilmy - It's such a crabby piece! I am similarly wearied by spew like this today, though I have a feeling this author and I would be on the same page about movies like Housefull and Ready. You and I hadn't "met" yet when I first found the treasure trove of Filmfares at the library of the university where I work. They have almost every issue from 1962 to the present. :D Some old Stardusts too! I've posted a few scans this year, mostly in April-June.